In March 1921, the garrison of the Baltic island fortress of Kronstadt, gateway to revolutionary Petrograd, revolted against the Bolshevik government. The mutineers held Kronstadt for two weeks, until the Soviet regime finally retook it by a direct assault across the ice, at a cost of many lives on both sides. The rebels claimed to be fighting to restore a purified Soviet power freed from the monopoly of the Communists. The Bolsheviks charged that the revolt was a counterrevolutionary mutiny: whatever the sailors intentions, it could only aid the forces of capitalist restoration—ranging from avowed democrats to outright monarchists—united behind the White standard of clerical/tsarist reaction. Though militarily repulsed by the Soviet Red Army after nearly three years of civil war, the White Guards and their imperialist patrons remained intent on reversing the Bolshevik-led October Revolution of 1917 and crushing the young Soviet workers state. Nearly 73 years later, on 10 January 1994, self-selected White Guard heir Boris Yeltsin, president of a now-capitalist Russia, placed his double-headed-eagle seal of approval on the Kronstadt revolt (see Kronstadt and Counterrevolution: Then and Now, Workers Vanguard No. 595, 4 March 1994). The fact that Yeltsin, who had led the 1991-92 overturn of the Bolshevik Revolution, rehabilitated the Kronstadt mutineers simply confirmed once again whose class interests were served by the 1921 uprising. The Kronstadt mutiny is the center of a great myth, assiduously propagated by anarchists but seized upon by a whole array of anti-revolutionary forces ranging from social democrats to tsarist restorationists. The principal aim of the hue and cry over Kronstadt has always been to discredit the Marxists struggle for the dictatorship of the proletariat over the bourgeoisie, and in particular to smear Trotskyism, the contemporary embodiment of authentic Leninism. According to anarchist myth, Kronstadt was the third toilers revolution—a continuation of the February and October revolutions of 1917—its suppression proof positive of the anti-working-class character of the Bolshevik government of Lenin and Trotsky, and of Marxism in general. To wield Kronstadt as an ideological club against Leninism, the anarchists have to insist, against all known facts, that the mutineers of 1921 were the same sailors who had played a vanguard role in 1917 and that they were not linked to the White reactionaries. Yeltsin unwittingly helped drive a nail in the coffin of the Kronstadt myth when, in blessing the mutineers, he also opened the archives for study of the mutiny. This led to the 1999 publication of a huge collection of Russian historical materials by ROSSPEN, the main publishing house associated with the Federal Archival Agency of Russia. The documents in Kronshtadtskaia tragediia 1921 goda, dokumenty v dvukh knigakh (The 1921 Kronstadt Tragedy, Documents in Two Volumes) (Moscow: Russian Political Encyclopedia, 1999) confirm beyond doubt the counterrevolutionary nature of the Kronstadt rising. Right from the start, the anarchists made common cause with open counterrevolutionaries over Kronstadt. Prominent American anarchist Alexander Berkmans 1922 pamphlet, The Kronstadt Rebellion, was based largely on a spurious 1921 account entitled The Truth About Kronstadt published by the Social Revolutionaries (SR), bitter opponents of the October Revolution. In 1938, the Kronstadt lie machine was rolled out again—in the form of Ida Metts The Kronstadt Commune—this time in an effort to deflect Trotskys devastating critique of the role of the CNT anarchist union leaders (in league with the Stalinists) in derailing the Spanish workers revolution. (For more on the Spanish Revolution, see Felix Morrow, Revolution and Counterrevolution in Spain [New York: Pioneer Publishers, 1938].) Shortly before his death in 1945, Voline (V. M. Eichenbaum), a leading Russian anarchist in 1917-21, added his authority to the anti-Bolshevik frame-up with an indictment that relied on the mutineers own lying proclamations (Voline, The Unknown Revolution [Kronstadt 1921 Ukraine 1918-21] [New York: Libertarian Book Club, 1955]). Today, a resurgent anarchist trend again seizes on alleged atrocities by Lenin and Trotskys Bolsheviks in Kronstadt to inflame anti-communist prejudices among young activists in the post-Soviet era. Every serious piece of historical research since has vindicated the Bolsheviks. Notably, this includes pro-anarchist historian Paul Avrichs Kronstadt 1921 (Princeton: Princeton University Press, 1970). In our review, we recommended the book as the work of a conscientious researcher, who was compelled to conclude that he could sympathize with the rebels and still concede that the Bolsheviks were justified in subduing them (Anarcho-Libertarian Myths Exposed: Kronstadt and Counterrevolution, WV Nos. 195 and 203, 3 March and 28 April 1978). Avrichs research showed that the principal leader of the revolt, a seaman named Stepan Petrichenko, had earlier attempted to join the Whites, then helped turn a mass protest meeting into a decisive break with the Bolshevik government. After the uprising, Petrichenko fled to Finland, which was under the iron rule of former tsarist general and White Guard butcher Baron Mannerheim. Petrichenko openly joined forces with the émigré White Guards concentrated there and endorsed plans for a temporary military dictatorship to replace Bolshevik rule. Avrich also discovered a White Guard Memorandum on the Question of Organizing an Uprising in Kronstadt that detailed the military and political situation inside the fortress and spoke of having recruited a group of Kronstadt sailors who were preparing to take an active role in a forthcoming uprising there. Nonetheless, Avrich asserted that there was no evidence of links between the Whites and the sailors before the revolt and echoed the common refrain that had the revolt been planned, it would have been launched a few weeks later, after the ice melted and made a Bolshevik ground assault impossible. The documents assembled in Kronstadt Tragedy definitively put these objections to rest. The collection contains 829 original documents (with an additional 276, in whole or excerpted, in the footnotes), most never before published. These include firsthand accounts by participants in the uprising, among them mutinous sailors and visiting White Guard emissaries, and secret White reports; memoirs and articles by some of the 8,000 mutineers who fled to Finland after the Bolsheviks retook Kronstadt; and records of interrogation of arrested mutineers by the Soviet Cheka, the All-Russian Extraordinary Commission to Combat Counterrevolution and Sabotage. Contemporary Soviet accounts include Baltic Fleet commissar Nikolai Kuzmins 25 March 1921 report to the Petrograd Soviet and the first official report on the Cheka investigation, by Special Commissioner Yakov S. Agranov, submitted on 5 April 1921. It is particularly valuable now to be able to see how extensively the accounts of the mutineers who escaped coincide as to the facts with those who confessed while in Soviet hands. An extensive introduction by Russian historian Yuri Shchetinov, who has done earlier research on Kronstadt, is quite useful, pointing to disputed questions and summarizing relevant archival findings. The documents were culled from a range of Soviet, White Guard, imperialist, Menshevik, Social Revolutionary and anarchist sources and compiled by researchers from nine Russian archives, including the Russian State Military Archive, the Russian State Archive for Socio-Political History and the Central Archive of the Federal Security Services (FSB), the political police. The chief researcher for the collection, I. I. Kudryavtsev, helped prepare materials from the FSB archive and was responsible for the footnotes, indices and bibliography. The name index entry for Trotsky claims he was a member of French Masonic Lodge, expelled apparently in 1916. This ludicrous libel, reflective of a counterrevolutionary hatred of the Bolshevik leader, flies in the face of Trotskys struggle to root out the pernicious influence of Freemasonry in the young French Communist Party, a historic problem in the French workers movement. A new book by French historian Jean-Jacques Marie, of Pierre Lamberts Parti des Travailleurs (PT), seizes on this libel to impugn the collection as a whole, asserting that the compilation is endowed with an abundant body of footnotes, which bears the imprint of the political police, the FSB (the former KGB), and is marked by an obsession, rampant among the Russian nationalists, with a supposed Masonic plot (Jean-Jacques Marie, Cronstadt [Paris: Fayard, 2005]). Yet Marie relies on this compilation for the bulk of his own citations! While the FSB is steeped in Great Russian chauvinism, the libel of Trotsky in Kronstadt Tragedy is singular and is not representative of the collections editorial work. Maries inordinate concern over a non-existent Masonic obsession in Kronstadt Tragedy says more about the Lambertist PT, whose connections with Freemasonry have long been an open secret on the French left. Among these are the close ties between Lambert, long an official in the Force Ouvrière (FO) trade-union federation, and former FO leader Marc Blondel, an open Mason. For their part, various anarchist Web sites and zines, confronted with the mass of new evidence in Kronstadt Tragedy, have turned to a secondhand commentary by Hebrew University academic Israel Getzler (The Communist Leaders Role in the Kronstadt Tragedy of 1921 in the Light of Recently Published Archival Documents, Revolutionary Russia, June 2002). Getzler elevates the Agranov report to pride of place, though it was rushed out only days after the mutiny and without access to any of the ringleaders nor to many of the documents in the present compilation. Getzler then extracts from this initial report one isolated passage in order to claim that Agranov found that the sailors protest was entirely spontaneous and that his findings flatly contradict the official line. This is sophistry, not scholarship! The Bolsheviks official line was not that Kronstadt was a White Guard/imperialist conspiracy from start to finish and top to bottom, but rather that it served the interests of and was fully embraced by the counterrevolution. Even the brief passage Getzler cites from Agranov corroborates this, asserting that the uprising took on a systematic character and was led by the experienced hand of the old generals (Agranov, Report to Cheka Presidium, 5 April 1921; reprinted in Kronstadt Tragedy [our translation]). In fact, as we shall see, the many documents in Kronstadt Tragedy studiously ignored by Getzler do indeed show that, far from being entirely spontaneous, there was a counterrevolutionary conspiracy at the heart of the Kronstadt toilers revolution. They flesh out, in unambiguous detail, the scale and scope of organized White Guard activity in and around Kronstadt, meshing with the anonymous memorandum uncovered by Avrich. Indeed, one of the newly published documents is by the prominent White agent believed by Avrich to have authored that memorandum, counterrevolutionary National Center operative G.F. Tseidler, who boasts how right-wing émigrés from Finland (cloaked as a Red Cross delegation) were welcomed to Kronstadt by Petrichenko and other mutiny leaders. Another report, by a leading White agent resident in Finland, General G.E. Elvengren, not only credits a White Guard organization in Kronstadt with fomenting the uprising but explains why it was launched earlier than planned. Of particular interest in demonstrating a hidden hand behind the uprising are the numerous firsthand accounts that testify to the systematic deception employed by Petrichenko and his allies in order to bring a section of the garrison out with them. In preparing this article, we also studied a number of other Russian-language materials, including both primary and secondary sources. Among these is a series of articles on the Kronstadt mutiny published throughout 1930-31 in the Leningrad historical journal Krasnaia Letopis, including an analysis by Soviet historian A.S. Pukhov of how the social composition of the Kronstadt garrison changed between 1917 and 1921. We also consulted with Yuri Shchetinov, who wrote the introduction to Kronstadt Tragedy, and obtained from him excerpts of his earlier book, Kronshtadt, mart 1921 g. (Kronstadt, March 1921), whose publication was halted in 1992 after Yeltsin took the reins of power. All translations from Kronstadt Tragedy and other Russian-language sources are ours. The workers revolution in Russia took place in a backward, overwhelmingly peasant country, creating, in Trotskys words, a dictatorship of the proletariat resting on the poor peasantry. The long-term existence of Soviet Russia could only be assured through the spread of socialist revolution to the advanced industrial powers of West Europe and the rest of the world. In the meantime, the support or neutrality of the peasant masses was key to safeguarding the revolution. This meant winning over the poorer peasants with consumer goods, tractors and other manufactured products, ultimately laying the basis for a rural proletariat based on large-scale, collectivized farming. But in the winter of 1920-21, Soviet Russia lay in ruins after seven years of imperialist war and civil war. The armies of 14 capitalist states had invaded revolutionary Russia. These provided assistance to capitalist-restorationist armies led by former tsarist military commanders Denikin, Kolchak, Wrangel, Yudenich and others, who ravaged the country and systematically massacred Jews and Communists, as well as militant workers and recalcitrant peasants. Industry and transport were paralyzed and major cities depopulated, as the starving foraged for food. In the countryside, famine and pestilence on a scale not seen in centuries had driven the villages to the point of cannibalism. All this was exacerbated by an imperialist economic blockade. The policies the Bolsheviks improvised to cope with these calamities were dubbed War Communism. At their core was seizure of grain from the peasantry in order to feed the cities and provision the Red Army. Throughout the Civil War, the mass of the peasantry accepted this as a lesser evil than the return of the White gentry. These peasant stirrings and revolts provided fertile soil for organized counterrevolutionary agitation and conspiracies. These conditions directly influenced developments in Kronstadt. While the tsarist army had been overwhelmingly peasant in composition, the Baltic Fleet—with its reliance on engineering and technical skills—had a slim working-class majority in 1917. But as the most class-conscious fighters went off to the front lines of the Civil War or to take over administrative and command positions in the apparatus of the new workers state, they were replaced by more backward and more heavily peasant layers—including, by 1920-21, a sizable number of peasant recruits from the rebellious parts of the Ukraine. Another factor affecting Kronstadt was the deep division within the Communist Party over where to go from War Communism and how to reinvigorate the smychka, the alliance of the peasantry with the workers state. In the months before the mutiny, a sharp dispute broke out pitting Trotsky against Lenin in the so-called trade-union debate. Seizing on Trotskys wrong-headedness, Zinoviev mobilized his own base in the Petrograd-Kronstadt area against Trotsky, whom he saw as a rival within the party leadership. Zinoviev opened the floodgates of the Kronstadt party organization to backward recruits while encouraging a poisonous atmosphere in the inner-party dispute. The rot in the Kronstadt Communist Party organization was a critical factor in allowing the mutiny to proceed, as Agranov noted in his Cheka report. The Kronstadt revolt began in the wake of workers protests that started in Petrograd on February 20 when a fuel crisis forced the closure of major factories. Through a combination of concessions to the workers and arrests of key Menshevik agitators, the government quickly quelled the protests without any bloodshed. But rumors of workers being shot and factories bombarded nonetheless made their way to Kronstadt on February 25. Delegations of sailors from the warships Petropavlovsk and Sevastopol went to Petrograd and saw that these rumors were false. When they returned to Kronstadt on February 27, they did not, however, dispel the lies. Instead, fresh lies were heaped on—including that thousands of sailors in Petrograd had been arrested. Arms were distributed to the Kronstadt sailors. Shipboard meetings on February 28 were quickly followed by a March 1 mass meeting in Kronstadts Anchor Square, which adopted a program of demands, and a delegated meeting on March 2 to discuss new elections to the local soviet. Communist speakers at these meetings were cut off. In fact, the Provisional Revolutionary Committee (PRC) had already elected itself and sent messages to the various Kronstadt posts the night before, declaring: In view of the situation in Kronstadt at this time, the Communist Party is removed from power. The Provisional Revolutionary Committee is in charge. We ask that non-party comrades take control into their hands (To All Posts of Kronstadt, 2 March 1921, 1:35 a.m.; reprinted in Kronstadt Tragedy). Here was an early taste of free soviets, anarchist-style! It was the commandant of the prison, none other than an anarchist named Stanislav Shustov, who proposed shooting the leading Communists. In his report to the 25 March 1921 session of the Petrograd Soviet, fleet commissar Kuzmin described how the threat of mass executions was nearly carried out. Early on the morning of March 18, Shustov set up a machine gun outside the cell, which contained 23 prisoners. He was prevented from slaughtering the Communists only by the advance of the Red Army across the ice. As Lenin noted, There was very little that was clear, definite and fully shaped about the Kronstadt demands (The Tax in Kind, 21 April 1921). They included new elections to the soviets; no restrictions on the anarchist and left socialist parties; no controls on trade-union or peasant organizations; freeing Menshevik and SR prisoners and those arrested in recent rural and urban unrest; equalization of rations; and pivotally, the demand to grant the peasants full freedom of action on all land as they wish, and the right to own cattle, which they should tend to themselves, i.e., without the use of hired labour (March 1 Resolution; reprinted in Kronstadt Tragedy). Had this petty-bourgeois program of unrestricted trade and opposition to any economic planning actually been carried out, it would have rapidly generated a new capitalist class from among the most successful peasants, artisans and enterprise managers and opened the door to a return of the old capitalists and the imperialists. The program was carefully crafted with the peasant prejudices of the sailors in mind. The mutineers demanded the abolition of the political departments and Communist fighting detachments in all military units, and of Communist patrols in the factories. The call for all power to the soviets and not the parties was simply petty-bourgeois demagogy designed to swindle the masses of sailors into supporting counterrevolution. In practice, it meant Down with the Communists! The more far-sighted adherents of counterrevolution understood that if the Communists were driven from power, whatever the slogans, it would be a short step to restoring capitalist rule. In the pages of his Paris-based newspaper, Constitutional Democrat (Kadet) leader Pavel Miliukov counseled his fellow reactionaries to accept the call, Down with the Bolsheviks! Long live the Soviets! As this would likely mean only a temporary passing of power to the moderate Socialists, argued the shrewd bourgeois Miliukov, not only the Monarchists but other candidates for power living abroad have no rhyme or reason for being in a hurry (Poslednie Novosti, 11 March 1921; quoted in Wright, The Truth About Kronstadt). What could the demand for free soviets mean in the context of Soviet Russia in 1921? Many of the most advanced workers had fought in the Red Army and perished or been drafted into important administrative posts. With the factories decimated and deprived of their best elements, the soviets atrophied. The regime of workers democracy was preserved by the layer of cadre in the Communist Party. The revolutionary-minded elements of all the socialist and anarchist tendencies had gone over to the Bolsheviks, either individually or in regroupments. In 1917, the anarchists had briefly enjoyed some influence among the more volatile elements of the Petrograd proletariat and garrison because of their militant posture against the capitalist Provisional Government. After the October Revolution, the best of the anarcho-syndicalists, like Bill Shatov, a Russian American who had been a prominent Wobbly in the U.S., sided with the Bolsheviks in defense of the workers revolution. Those who didnt turned to criminality and terror against the workers state, from staging armed robberies to bombing Moscow Communist Party headquarters in 1919. The socialist parties that had joined the Provisional Government, the Mensheviks and Right SRs, were by 1921 empty shells and lackeys of counterrevolution. The Left SRs, after briefly serving in the Soviet government, joined in 1918 in underground terror against the workers state. The Mensheviks posture of abiding by Soviet legality was dropped at every chance of a capitalist overthrow of the Soviet republic. In Petrograd the remnants of the SRs, Mensheviks and various anarchists banded together in an Assembly of Plenipotentiaries of the Factories and Shops of Petrograd. This shadowy, unelected bloc collaborated with the newly formed monarchist Petrograd Combat Organization (PCO), as the PCO itself asserted (PCO Report to Helsinki Department of National Center, no earlier than 28 March 1921; reprinted in Kronstadt Tragedy). The PCO even printed the Mensheviks leaflets! On March 14, the Assembly issued a leaflet in solidarity with Kronstadt that said not one word about socialism or soviets, but instead called for an uprising against the bloody communist regime in the name of all power to the people (Appeal to All Citizens, Workers, Red Army Soldiers and Sailors, 14 March 1921; reprinted in Kronstadt Tragedy). Despite lies spun by the press of the mutineers claiming mass uprisings in Petrograd and Moscow, even Menshevik leader Fyodor Dan admitted in a 1922 book that There were no plenipotentiaries and that the Kronstadt mutiny was not supported by the Petersburg workers in any way (quoted in The Mensheviks in the Kronstadt Mutiny, Krasnaia Letopis, 1931, No. 2). The workers immediately felt that the Kronstadt mutineers stood on the opposite side of the barricades—and they supported the Soviet power, explained Trotsky (Hue and Cry Over Kronstadt, 15 January 1938). It is noteworthy that even the wing of the Communist Party that most zealously sought to champion the immediate economic interests of the workers, the semi-syndicalist Workers Opposition, participated in the crushing of the Kronstadt uprising. The Agranov report noted that all participants of the mutiny carefully hid their party physiognomy under the flag of being non-party (Agranov, Report to Cheka Presidium). The mutiny leaders skillfully felt their way. For example, PRC chief Petrichenko pulled back after his proposed call to enfranchise all socialist parties was met with an angry rebuff from sailors at a March 1 meeting preceding the Anchor Square rally. According to Kuzmin, the crowd shouted at Petrichenko: Thats freedom for the right SRs and Mensheviks! No! No way! The stench of White Guard reaction wafted ever more openly through Kronstadt as the mutiny progressed and the bid to draw in the Petrograd workers with talk of free soviets failed. Already on March 4, the commander of the Sevastopol issued a written order that spoke of long-suffering, tortured and dismembered Russia and duty to the motherland and the Russian people (quoted in Agranov, Report to Cheka Presidium, 5 April 1921; reprinted in Kronstadt Tragedy). By March 15, such language appeared in an official PRC appeal. Addressed above all to the White émigré Russian people who have been ripped away from a Russia that lies torn from limb to limb, the appeal stated: We fight now for the overthrow of the yoke of the party, for genuine soviet power, and then, let the free will of the people decide how it wants to govern itself (Appeal by Kronstadters, 15 March 1921; reprinted in ibid.). The appeal tellingly concluded with talk not of free soviets but of the holy cause of the Russian toilers in the building of a free Russia. This was unambiguously a call for democratic counterrevolution. On March 21, three days after its dispersal, the PRC in exile issued an even more blatant appeal proclaiming: Down With the Party Dictatorship, Long Live Free Russia, Long Live the Power Elected by the Whole of the Russian People! (To the Oppressed Peasants and Workers of Russia, 21 March 1921; reprinted in Kronstadt Tragedy). Notably, the March 15 appeal was issued by Petrichenko in direct response to the general staffs demands that the PRC secure outside aid. That same day, the PRC secretly dispatched two members to Finland to seek aid. When, on March 17, Petrichenko and the PRC tried to enforce the officers decision that the crews of the Petropavlovsk and Sevastopol abandon ship, blow up their artillery and flee to Finland, this was the last straw. The vast majority of the crews rose up, saved the vessels and arrested all the officers and PRC members they could get their hands on (cited in Agranov, Report to Cheka Presidium). If the Kronstadt mutiny was a revolution, it was a very strange one, indeed—supported by the imperialists, the Russian monarchists and capitalists and their Menshevik and SR lackeys! The revolt, observed Trotsky in a 23 March 1921 article, led to an immediate rise on the Paris and Brussels stock exchanges, particularly in Russian securities (Kronstadt and the Stock Exchange, Kronstadt by V.I. Lenin and Leon Trotsky). The defeated White émigré forces hurriedly patched together combat units. A former member of General Denikins entourage, N.N. Chebyshev, recalled in a 23 August 1924 article in the émigré press: White officers roused themselves and started seeking ways to get to the fight in Kronstadt. Nobody was interested in who was there—SRs, Mensheviks or Bolsheviks who had become disenchanted with communism, but who still stood for the Soviets. The spark flew among the émigrés. Everybodys spirit was lifted by it (quoted in Shchetinov, Introduction to ibid.). Émigré leaders, whose appeals to West European states had earlier fallen on deaf ears, were now embraced. While accepting that France might have given some aid, Avrich argued in Kronstadt 1921 that the Whites were basically spurned, checked by Western diplomatic obstacles. In fact, while France and Britain held back from open participation, they encouraged the small states bordering Russia to assist the mutiny. British foreign minister Lord Curzon wired his representative in Helsinki on March 11 stating: His Majestys Government are not prepared themselves to intervene in any way to assist the revolutionaries. Very confidential: There is no reason, however, why you should advise the Finnish Government to take a similar course or to prevent any private societies or individuals from helping if they wish to do so (Documents on British Foreign Policy 1919-1939 [London: Her Majestys Stationery Office, 1961]). Suffice it to say that deliveries of food supplies to Kronstadt were allowed to proceed without serious interference, as was the concentration of White expeditionary forces in Finland. In his 1921 Cheka report, Agranov documented the authoritative role played by General Kozlovsky and other bourgeois officers on the general staff. The anarchists have long argued that these officers simply functioned in an advisory capacity, and had been, in any case, appointed as military specialists by the Bolshevik government. Viewed by the mass of sailors with extreme suspicion, the officers certainly kept a low profile. But where they had earlier served under the strict supervision of Communist commissars, now the commissars were in jail, and the generals were on top. Kozlovsky sneered as he seized control from the commissar of the Kronstadt Fortress (V.P. Gromov) at a March 2 meeting, Your time is past. Now I shall do what has to be done (quoted in A.S. Pukhov, Kronstadt Under the Power of the Enemies of the Revolution, Krasnaia Letopis, 1931, No. 1). A senior officer arrested in the wake of the mutiny further testified that in daily operational matters, The Chairman of the PRC [Petrichenko] typically subordinated himself to the decision of the Chief of Defense [tsarist fort commander Solovianov] and did not raise objections to the latters operational activities (Minutes of Cheka Interrogation of P.A. Zelenoi, 26 March 1921; reprinted in Kronstadt Tragedy). Officers like Kozlovsky provided an invaluable connection to the White émigré forces with whom they had served in the tsarist army. Among the latter was Baron P. V. Vilken, the former commander of the Sevastopol, who was tied to the London-based Naval Organization, a White Guard spy nest closely monitored by the Soviet Cheka Foreign Department. Russian intelligence services have now published the monitored Naval Organization correspondence and money transfers. The first of a series of telegrams described as proposing necessary measures in support of the Kronstadt mutiny in Russia, sent on 25 February 1921, instructed an agent to receive 400 Pounds Sterling and send it via two checks to Helsinki, which needs the money in the beginning of March (Russkaia voennaia emigratsiia 20-x—40-x godov [The Russian Military Emigration 1920s-1940s], Volume One [Moscow: Geya, 1998]). While left apologists for the mutiny have no choice but to acknowledge that the imperialists hailed the uprising, they claim that the mutineers themselves had nothing to do with the imperialists or the Whites. Anarchists love to cite the 6 March 1921 editorial in Izvestia of the PRC that struck a pose of vigilant opposition to the Whites: Look sharp. Do not let wolves in sheeps clothing approach the helmsmans bridge (quoted in Avrich, Kronstadt 1921). But we now know that two days after this editorial appeared, the PRC, behind the backs of the sailors, welcomed a whole pack of these wolves—including a courier from the SR Administrative Center; one Finnish Special Services agent; two representatives of the monarchist Petrograd Combat Organization; and four White Guard officers, including Vilken. Vilken and another officer, General Yavit, were formally there as part of a three-man Red Cross delegation sent from Finland by National Center operative G.F. Tseidler. According to a detailed report by Tseidler to Russian Red Cross headquarters, a front for the Whites, the delegation was immediately invited to a joint session of the PRC and the general staff officers, where an agreement was reached for the provisioning of Kronstadt. When, Tseidler relates, one PRC member questioned whether the PRC had the right to accept the proposed aid without first consulting the public that elected them, as it could be seen as proof of selling out to the bourgeoisie, he was overruled with the line that we cannot have continuous mass meetings (Tseidler, Red Cross Activity in Organizing Provisions Aid to Kronstadt, 25 April 1921; reprinted in Kronstadt Tragedy). The PRC, seeing that Kronstadt was filling up with agents of a monarchist organization, issued a declaration that it would not enter into negotiations with, nor accept any aid from, any non-socialist parties. 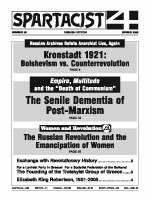 — Komarov Report, Stenographic Report of Petrograd Soviet, 25 March 1921; reprinted in ibid. Vilken urged the PRC to come out for the Constituent Assembly. Komarov reports asking Perepelkin: And if on the day after, the baron had demanded of you not just the demand for a Constituent Assembly, but for a military dictatorship? Then how would you have dealt with the question? Perepelkin replied, I admit it, I can now frankly state that we would have adopted that as well—we had no other way out. This was the third revolution! Vilken was to remain at Kronstadt, essentially part of the operational leadership along with Petrichenko and the general staff, until the end. He was even invited to address a special crew meeting on his former command, the Sevastopol, on March 11. Tseidler himself (along with General Wrangels political representative in Finland, Professor Grimm) was mandated to represent Kronstadt as the government of the liberated territory of Russia. One of the first acts of the Independent Republic of Kronstadt was a radiogram, whose interception was reported into a March 9 session of the Bolshevik Tenth Party Congress then meeting in Moscow, congratulating Warren G. Harding upon his inauguration as U.S. president (cited in Shchetinov, Introduction to Kronstadt Tragedy)! Writing in 1938, Trotsky stated: The logic of the struggle would have given predominance in the fortress to the extremists, that is, to the most counterrevolutionary elements. The need for supplies would have made the fortress directly dependent upon the foreign bourgeoisie and their agents, the White émigrés. All the necessary preparations towards this end were already being made (Trotsky, Hue and Cry Over Kronstadt). The archives completely vindicate Trotsky. As we have noted, current anarchist apologists for Kronstadt make much of the work of Israeli academic Israel Getzler. The Infoshop Web site, for example, features an exhaustively anti-Leninist 100-plus-page tract on Kronstadt that claims, Anarchist accounts have been validated by later research while Trotskyist assertions have been exploded time and time again (What Was the Kronstadt Rebellion?, www.infoshop.org, undated). Let us see. Getzler pompously declaims that the question of the spontaneity of the revolt, which has bedevilled the historiography of the Kronstadt movement for six decades, [is] now settled—at least to my satisfaction (The Communist Leaders Role in the Kronstadt Tragedy of 1921 in the Light of Recently Published Archival Documents, Revolutionary Russia, June 2002). All this because Cheka commissioner Agranov wrote, on the basis of the very limited evidence available in the days immediately after the mutiny, that this investigation failed to show that the outbreak of the mutiny was preceded by the activity of any counterrevolutionary organization at work among the fortresss command or that it was the work of [imperialist] Entente spies (Agranov, Report to Cheka Presidium, 5 April 1921; reprinted in Kronstadt Tragedy). — Elvengren, Report to Russian Evacuation Committee in Poland, no later than 18 April 1921; reprinted in ibid. Getzler also asserts, again to hosannas from Infoshop, that of the 2,028 Petropavlovsk and Sevastopol crew members whose years of enlistment are known, Only some 137 sailors or 6.8% were recruited in the years 1918-21, including three who were conscripted in 1921, and they were the only ones who had not been there during the 1917 revolution. Getzlers only proof for this is February 1921 crew lists cited in S. N. Semanovs Likvidatsiia antisovetskogo Kronshtadtskogo myatezha 1921 goda (The Suppression of the 1921 Anti-Soviet Kronstadt Mutiny; originally published in Voprosy istorii, 1971, No. 3). We examined Semanovs lists as well; they indicated when the sailors enlisted, but not where they had served in 1917. The evidence indicates that the 1921 crews were overwhelmingly not veterans of Kronstadt 1917. For example, in his unpublished Kronstadt, March 1921, Yuri Shchetinov shows that the crew of the Petropavlovsk was reduced from nearly 1,400 to just 200 by late 1918; the majority of the replacements were not veteran Kronstadters but conscripts—former crewmen of navy, merchant marine and river vessels—who had quit after the revolution rather than serve voluntarily in the newly constituted Red Navy: Among those mobilized were not a few sailors who had served in the Black Sea and Northern Fleets, where, by comparison to the Baltic Fleet, the influence of SRs and anarchists was notably greater (Shchetinov, Kronstadt, March 1921). Finally, we have Paul Avrich making it clear that the mutineers of 1921 were not the red Kronstadters of 1917: Although the rebels...denied any anti-Semitic prejudice, there is no question that feelings against the Jews ran high among the Baltic sailors, many of whom came from the Ukraine and the western borderlands, the classic regions of virulent anti-Semitism in Russia (Avrich, Kronstadt 1921). Izvestia editor Lamanov admitted that anti-Semitic poison about the Jews having murdered Russia was so rife—and that quite often authors would bring in writings of this sort—that he made it his job to block anti-Semitic propaganda (Further Minutes of Questioning of Anatoly Lamanov, 25 March 1921; reprinted in Kronstadt Tragedy). These sanitized Izvestia articles were then held up as proof of the mutineers revolutionary intentions by Voline and other anarchist apologists who, to use Trotskys words, quote the proclamations of the insurgents like pious preachers quoting Holy Scriptures (Hue and Cry Over Kronstadt). Well before Kronstadt erupted, it was clear to the Bolshevik leaders that the regime of War Communism had run its course. After months of discussion, the New Economic Policy (NEP) was formally adopted at the Tenth Party Congress, which met as the mutiny raged. Already in February 1920, Trotsky had proposed replacing forcible grain requisitions with a tax that the government would collect in the form of agricultural products—a tax in kind—the core of the NEP. His proposal was then rejected, and Trotsky responded by seeking to implement and extend War Communism with heightened military-administrative zeal, advocating in a factional fashion that the Soviet trade unions merge with the state apparatus to run the economy. Behind this proposal lay the assumption that in a workers state, basic organizations of working-class defense like unions were at best superfluous, and at worst levers for the kind of retrograde economic and bureaucratic resistance he had contended with as commander of the Red Army during the Civil War. Trotsky lost a lot of authority, making himself vulnerable to internal opponents like Zinoviev (and Stalin). In The Truth About Kronstadt, John G. Wright acknowledges that insofar as the Zinovievite fleet commissar Kuzmin and the other local Communist leaders were blind to the full extent of the danger brewing at Kronstadt, they facilitated the counterrevolutionists work of utilizing the objective difficulties to attain their ends. But Wright stresses that what was at play was the fundamental counterposition of two class camps: All other questions can be only of a secondary importance. That the Bolsheviks may have committed errors of a general or concrete character cannot alter the fact that they defended the acquisitions of the proletarian revolution against the bourgeois (and petty-bourgeois) reaction (The Truth About Kronstadt). The great crime of the Bolsheviks, from the viewpoint of their democratic critics, is that they won. For the first time in history, a propertyless, oppressed class took and held power, proving in practice that the proletariat can indeed rule. That is what the hue and cry about Kronstadt has always been about. The Infoshop anarchists sneer at the Leninist principle (inviolable for every Bolshevik) that the dictatorship of the proletariat is and can be realized only through the dictatorship of the party (What Was the Kronstadt Rebellion?). Instead they put forth the Kronstadt slogan, All power to the Soviets and not to the parties. This attempt to counterpose the interests of the class, organized in soviets, to that of its revolutionary vanguard, organized in a Leninist party, is typical of the crude anti-leadership prejudices of the anarchists. If there was ever an example that proved that workers rule depended on the firm leadership of the communist vanguard—the dictatorship of the party, if you will—it was Kronstadt in 1921. The simple fact is that every other tendency in the workers movement, whether Menshevik or anarchist, supported counterrevolution! In a stable workers state Leninists favor full democratic rights for all political tendencies that do not seek the forcible overthrow of the proletarian dictatorship. That includes recognizing the possibility of the Communists losing a vote in soviet bodies. But the embattled Russian workers republic of 1918-22 was anything but stable, and had the Bolsheviks stepped down to be replaced by social-democratic, populist or anarchist elements, then very soon both the Leninists and their petty-bourgeois opponents would have found themselves facing the White firing squads. The suppression of Kronstadt gained time for the beleaguered Soviet workers state to revitalize the economy and the working class—and thus recreate the conditions for a vibrant soviet democracy—and to fight for the proletarian revolution to conquer elsewhere. Had the revolutionary opportunity in industrialized Germany two years later resulted in a proletarian victory, this would have been of decisive significance for the future not only of Soviet Russia but of the world socialist revolution (see Rearming Bolshevism: A Trotskyist Critique of Germany 1923 and the Comintern, Spartacist No. 56, Spring 2001). Feeding off the defeat in Germany, a bureaucratic layer in the Soviet party and state apparatus usurped political power from the proletariat and its Bolshevik vanguard. In our review of Avrichs Kronstadt 1921, we asked: What is the anarchist answer to the Allied blockade, flooded coal mines, torn-up railroads and blasted bridges, etc., with the consequence that there was nothing to trade the peasantry in exchange for its grain? (WV No. 195, 3 March 1978). The imperialists and Whites sought to drive a wedge between the workers government and the vast peasant masses. The Bolsheviks, possessing limited means and no functional large-scale industry, had to make concessions to the peasantry and to small-scale commodity production and trade. But the NEP could only be a temporary retreat—it had its own dangers, as became clear when the emboldened kulaks, the wealthier peasants, rebelled a few years later. What the bourgeoisie and their hacks, from the Mensheviks to Infoshop, cannot forgive is that Lenin and Trotsky did apply determined measures against the Kronstadt mutiny. The proletariat owes an eternal debt to the 1,385 Red Army soldiers and commanders who gave their lives, and the 2,577 who were wounded, to defend the young Soviet workers state. The fresh historical evidence collected in Kronstadt Tragedy offers a compelling indictment of the lackeys of counterrevolution who smeared those revolutionary martyrs. Empire, Multitude and the "Death of Communism"